Gastro-esophageal reflux disease or acid-reflux disease or GERD is a condition in which the contents of the stomach reflux backward into the esophagus (foodpipe). Since the stomach contents are acidic in nature, this damages the inner lining of the food pipe and causes symptoms of heartburn, pain, etc. Some amount of reflux of stomach contents is normal in all individuals but not everyone develops GERD. The main reason behind this is that only in some individuals this refluxed fluid is more acidic and remains in the esophagus for longer duration thus causing GERD. Dietary causes and certain faulty habits are frequently responsible for initiating this condition in individuals who are prone to develop it. At the junction of the food pipe (esophagus) and the stomach is a muscular gateway (called lower esophageal sphincter or LES). 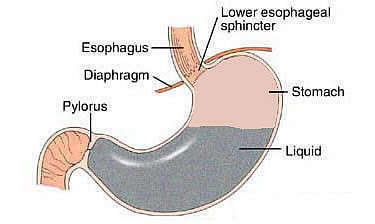 Under normal circumstances, this sphincter remains contracted so that no contents of the stomach can go back into the esophagus but when this sphincter becomes relaxed due to any reason or is weak, it may allow the contents of the stomach to flow back into the esophagus causing inflammation of the lining of the esophagus. There can also be many other causes of GERD which will be discussed in details later.